November 16th - 6 to 9 p.m. The Rotary Club of Haddonfield invites you to a midweek gathering with some of South Jersey's most distinguished chefs. Join friends for an enjoyable evening sampling each chef's specialties -- appetizers, entrees and desserts. A cash bar will be available. Click here for a flyer on the event, which you can feel free to share! 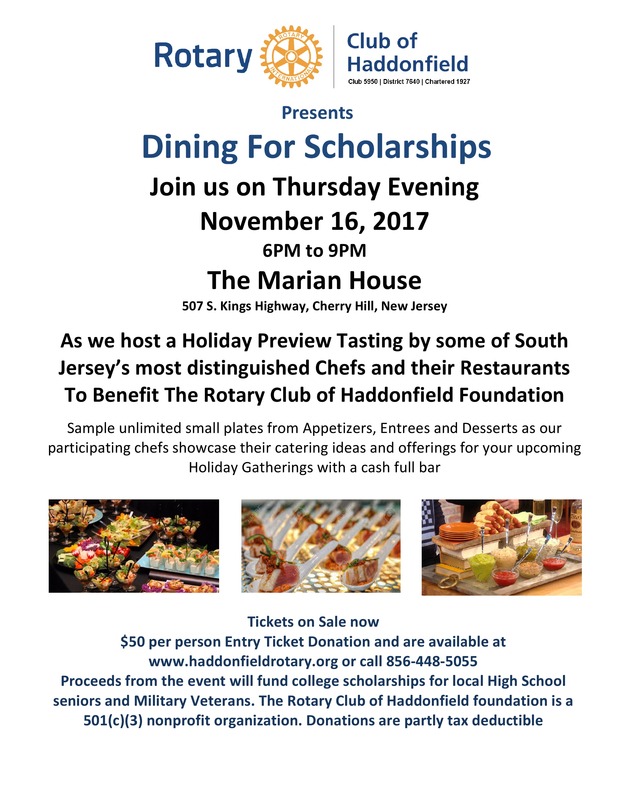 Proceeds from the Dining for Scholarships event will support the Rotary Club of Haddonfield Foundation's annual scholarship awards. Each year the Foundation gives a number of scholarships to deserving high school seniors from area schools. Last year $12,000 in scholarships was given out to support continuing education for an outstanding group of young people. Come enjoy a special evening, while supporting the next generation. An entry ticket donation of $50 per person includes all you can eat small plate samplings. Click below to purchase tickets. Chefs can click here for further details. And, click here for the sign-up form.